In response to the leaks from former NSA-worker Edward Snowden, President Obama swore to preserve the sprawling data collection programs, but he also vowed to make a number of reforms, including making government’s activities more transparent. And Wednesday, it appears that the government is taking at least a cosmetic step in that direction. On Tumblr. 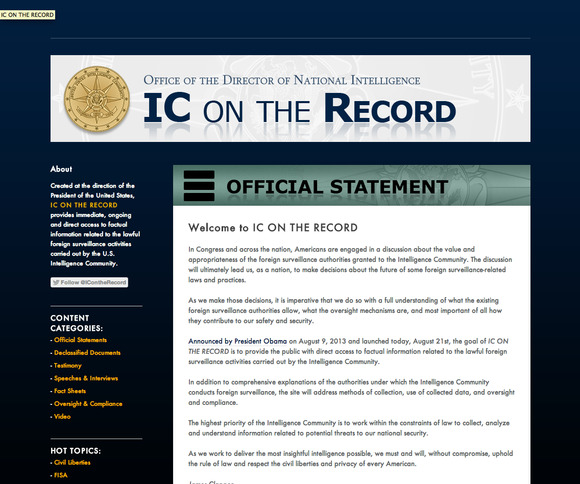 Today, the government unveiled an official Tumblr page dubbed IC on the Record (where “IC” stands for Intelligence Community”; and not “I Con The Record” as the URL unfortunately also spells), along with a corresponding Twitter account (@icontherecord). A representative from EPIC (the Electronic Privacy Information Center) commented that the organization supports additional government transparency around NSA Surveillance, "but the "IConTheRecord" Tumblr avoids official government channels for transparency and oversight. Many of these documents should have been released through other means: court dockets, Freedom of Information Requests, etc." So far, the website offers official previously-available government documents regarding privacy and surveillance, including the transcript of a Q&A with the NSA’s Deputy Director John C. Inglis from 2009. The website was announced during a conference call with reporters. During the call, more classified documents were promised to be available on the site, but as of publishing, the only "declassified documents" on the site have already been avaliable for several weeks. This story, "Government turns to Tumblr and Twitter for new intelligence transparency drive" was originally published by TechHive.